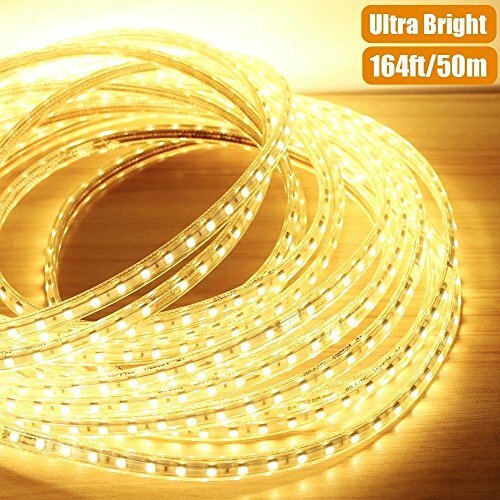 AccOED 164ft Flexible LED Strip Lights, 3000 Units SMD 5050 LEDs, 3000K Warm White, 720lm/m, 110-120 V AC, Waterproof IP65, Accessories Included, LED Rope Lights, LED Tape, Pack of 164ft/50m by AccOED at IGWT. MPN: LED. Hurry! Limited time offer. Offer valid only while supplies last. Color : Warm White Length per roll: 164ft/50m LEDs Quantity: 60/m (total 3000 per roll) Working Voltage: 110-120 V AC Waterproof: Yes Super bright. High Voltage. Low voltage drop. More little light attenuation, well-distribute lighting in the whole 164ft/50m strips. Note: Please don't plug the strip without unrolling it. If you have any questions about this product by AccOED, contact us by completing and submitting the form below. If you are looking for a specif part number, please include it with your message.